It’s always nice to refresh ones wardrobe before going on an adventure. It just feels good to be in a new place with new things, having new experiences. Plus, who wants the same outfits in all of their vacation photos? After one particularly rainy and sweaty day of exploring, the dye from my new garments started to bleed off on my skin. I put on seven miles, hoofing it through dank and rainy London and upon returning to my hotel found that my new jeans had turned my legs a very Smurfy blue. Always wash your new clothes before you travel! Oh my, that is so funny and a little sad. 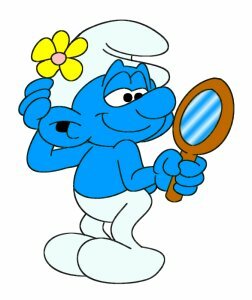 But truyly I think you would make an amazing Smurf!